This large country-style home accommodates ten people and provides a pool in which to play and cool off after a day exploring Yosemite. Enjoy all the comforts of home with a fully equipped kitchen, wonderful deck area for outdoor grilling and relaxing. 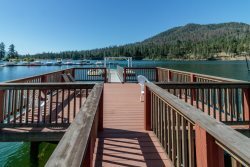 This home is ideally located in the heart of Oakhurst, with a 20 minute drive to the south entrance of Yosemite and 10 minutes to Bass Lake. Central AC, WIFI, Pool, deck, gas BBQ, Fully equipped kitchen with refrigerator, stove, oven, microwave, coffee maker, cookware, pots & pans, dishes, glasses, utensils, linens and towels, bedding. Close to town, restaurants, groceries, banks, post office, movie theater.